The national school walkout reached the campus Wednesday morning as students congregated in front of the E3 building at 10 a.m. The walkout was in response to the Florida shooting last month in which 17 students and staff members were killed at Marjory Stoneman Douglas High School. The mood was somber, as everyone in attendance remained silent while the names of the victims and their ages were being announced over a megaphone. The reading of the victims’ names, which were each given one minute of silence, was followed by a handful of students passionately addressing the issue at hand: gun safety, the laws surrounding the purchase of firearms and holding politicians accountable during election time. Orange ribbons symbolizing solidarity were also handed out to students along with sheets of paper explaining the purpose of the gathering. Students and faculty members also began to chant “Enough is enough,” in unison to voice their displeasure with the National Rifle Association and politicians. The event was organized by ELAC Students for Political Awareness. “When the students were standing (during the demonstration) thinking, they were experiencing the same silence as the students who were trying to keep quiet while trying to hide from the shooter … I think our congressmen need to stop taking money from these donors, the NRA. When you get donations from these organizations, there are strings attached,” ESPA member Genesys Sanchez said. ESPA member Regina Vazquez said that people may not think that such a thing could occur on our campus, but the laws surrounding surrounding guns will have an affect on the community. “This has been an issue that we’ve been talking about especially since the shooting occured in Florida. We didn’t know if anyone was going to be leading the event, so that’s why we jumped in and started organizing,” Vazquez said. Both Sanchez and Vazquez were pleased with the turnout of students and faculty members. Classes were being let out early by professors who believe in the cause, allowing students to participate without missing out on lecture. Students were even notified by their professors as soon as the walkout was set to take place. Assistant Professor of History Fernando Mejia said that the entire Political Science was in attendance to support what he refers to as the solidarity movement. 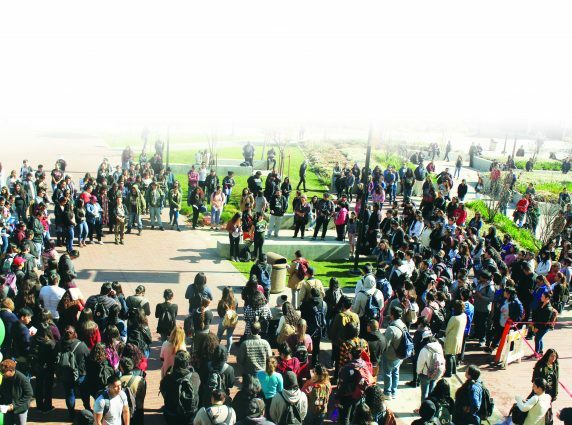 “We stood out there in silence and respect … What was amazing about the walkout was that it gave the faculty and administration a way to come together and be out there for one cause that was worth it … I noticed that a lot of students walking by would stop to hear what needed to be said or what was going on,” Mejia said. Although Mejia himself wasn’t teaching a class at the time of the event, he said that he would’ve encouraged his students to get out and participate. “This is something that is affecting them and they should be a part of it. This is their voice and they should be heard. I asked my students after the fact and they said that they felt emotion and connection to the victims and the message that was conveyed,” Mejia said. No matter how hard it was, we should make gun control and we are protect by law now. Absolutely, we shouldn’t use the gun to give vent our emotion. Why is East Los Angeles College – Admin of Justice listed on the NRA’s business alliance page?